You are invited to experience the wonder of the Avon Old Farms campus alongside one of our admission team members. By visiting our inspiring 860-acre top boys boarding school in the Northeast, you will become immersed in the energy of an all-boys school dedicated to allowing young men to explore their ambitions without reservation and develop into men of character, integrity, and honor. Visiting Avon Old Farms is easy and we are here to answer questions throughout each step. Please contact the Admission Office at 860-404-4167 or admissions@avonoldfarms.com for help or to schedule a tour. Submit the inquiry form to receive our viewbook. We want to get to know you; additionally, we want you to get to know Avon Old Farms. Schedule a campus tour and interview by calling the Office of Admission at 860-404-4167 or email admissions@avonoldfarms.com. SSAT (Secondary School Admission Test). Boys applying for grades 11, 12 and PG should submit PSAT, SAT, or ACT results. Avon Old Farms' School code is 1450. Recommendations forms from a current English and Mathematics teacher, as well as a guidance counselor or head of school, must be submitted along with the application. 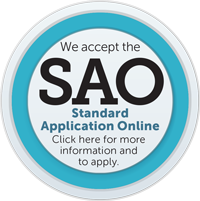 Avon Old Farms uses the Standard Application Online and recommendation forms are available through the SAO. Applications are due January 15 and financial aid applications are due February 1. Students receive admission decisions on March 10. Accepted student revisit days are April 3 and 6. We must receive your contract and deposit by April 10 to secure your spot. Our Admission Team is here for you every step of the way. 860 acres of bucolic countryside, one-of-a-kind architecture, and a niche for every young man to discover his best self – see the campus for yourself.